Preparatory Music Theory Exams Set 2 Answer Book (Answers to all Four Exams in Set 2 Exam Workbook), Saves Time for Quick, Easy and Accurate Marking! 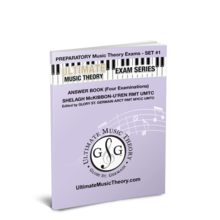 The Preparatory Music Theory Exams Set 2 Answer Book is a "must have" teacher resource for instantly marking all Four Exams in the Preparatory Music Theory Exams Set 2 Workbook. The UMT Exam Series is the ONLY exam series with matching Answer books!